Founded by a famous dragonslayer, the small town of Belhaim has become a sleepy rural community just off the beaten path, a settlement where everyone knows everyone and strangers are the talk of the town. But when Helhaim's peace and quiet is shattered by the sudden collapse of the last standing tower of it's founder's castle, things quickly bloom out of control. Why were there bodies of kobolds amid the rubble? What's the sinister secret behind the strange sounds of flapping wings in the night? And what's happened to local wizards Balthus Hunclay, who's not answering knocks on his door? The collapsed tower had long been an eyesore to the cantakerous old man - could he have had something to do with its destruction? And what of the rumours of strange stirrings in nearby Dragonfen? 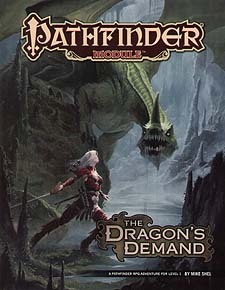 Has Belhaim's ancient draconic nemesis returned? The Dragon's Demand is a deluxe super-adventure for 1st-level characters, and includes 64 action-packed pages of adventure and new monsters, plus a beautiful double-sided, full-colour poster map of the town of Blehaim and an important miniatures-scale battleground! Players can expect to reach 7th level by the time they complete this epic adventure - if they manage to survive the wrath of a dragon when his demands aren't met!